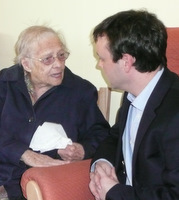 Stephen McPartland MP recently visited the Stevenage Day Centre, run by Crossroads Care North Herts, the leading charity offering respite care to carers. In addition to the Day Centre, Crossroads provides support and respite to carers by providing experienced carers who spend time with the "cared for", normally in their own homes, thus allowing the carers to have time off to spend as they wish. Crossroads can be contacted on 01462 455578. 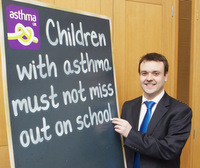 Stephen McPartland MP and Chair of the All Party Parliamentary Group on Asthma joined young people aged 11-16 from schools across England to Listen Up! about asthma, at Asthma UK’s annual youth conference held at the Houses of Parliament in April 2011. One in ten young people in England is currently receiving treatment for asthma and a fifth of children will miss around six or more days of school or college a year as a result of their condition. Ill health and misconceptions about the condition can mean that around a third of children with asthma are being left out of activities such as sport at school. 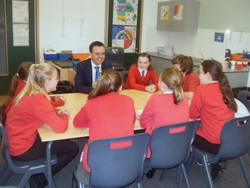 Stephen McPartland MP is delighted that disadvantaged children in the Stevenage area are set to receive £815,000 this year under the new government's Pupil Premium which is available for the first time. Stephen said:"This is fantastic news for local children. The gap between the academic performance of children from deprived backgrounds and their peers is far too big and has been ignored for too long. The Pupil Premium will tackle this head on, providing targeted funding for those who need it most. The new government is delivering a massive boost to the education of the most disadvantaged and vulnerable children in our area." The Pupil Premium is an extra lump sum of cash which follows every disadvantaged child and is received by schools, allowing them to provide additional support such as one-to-one tuition and extra pastoral care. In the year from April 2011, the pupil premium will be worth £430 for every pupil on Free School Meals and £430 for every looked-after child. This means that in Stevenage this year 1,900 children overall will benefit from an additional £815,000. Research conducted by a mobile and broadband comparison website shows that 3G mobile broadband speeds in Stevenage are amongst the worst for towns and cities in the UK. MP for Stevenage, Stephen McPartland MP is supporting the British Lung Foundation’s Children’s Charter campaign. He recently attended the BLF’s parliamentary launch and met the British Lung Foundation’s young campaign champions who explained the charity’s action plan to improve children’s lung health in the UK. Dame Helena Shovelton, Chief Executive for the BLF said: “The number of children whose lungs are being damaged by adults lighting up when children are in the car is alarming. We are calling on all children who want to put an end to passive smoking to add their voice to the BLF’s campaign by going to www.lunguk.org/childrenscharter. This is great news for local people, they will have more money, more jobs, more training and more educational opportunities. I am delighted we have frozen council tax, scrapped Labour's fuel duty escalator, reduced fuel duty by a penny, introduced the fair fuel stabiliser and increased personal tax allowances. So in just 9 months the Government has taken 1.1 million people out of tax altogether. With the pupil premium, funding for apprenticeships and slashing of bureaucracy for small businesses. We are reducing the gap between education and employment at the same time as giving local businesses the confidence to employ local people. Last week Stevenage MP Stephen McPartland dropped in to see leading advocacy charity, POhWER and update them on the progress of their feedback to a governmental white paper. POhWER sent a survey to members, held workshops and drew up a response called ‘We will if you will’ - which they handed to their MP last October. The charity’s response provided a unique perspective on the Government’s proposals and Stephen personally handed it to the Secretary of State for Health, Andrew Lansley. POhWER was particularly concerned that the independent complaints advocacy service (ICAS), which POhWER delivers in many parts of the country, including Hertfordshire, may be replaced by a more limited and less independent service. Stephen McPartland, Member of Parliament for Stevenage has been selected to serve on the Education Bill Committee. This is a small committee of MP's whose job is to scrutinise the government's flagship education reforms. Stephen said "This is a fantastic opportunity to get to the heart of legislation and make a real impact. I work closely with the Education team in Parliament and after I spoke in the Education debate, I was asked to take part. The bill offers us the opportunity to improve educational standards for all pupils, especially those from poorer backgrounds". The Education Bill covers everything from extending free education for fifteen hours a week to two year olds from disadvanated backgrounds, restoring discipline in the classroom, reforming OFSTED inspections, to Academies and Free Schools. 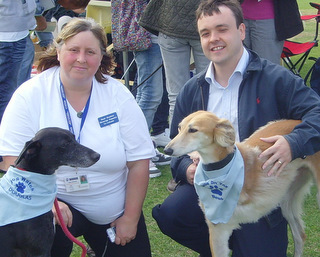 Stephen McPartland MP was very pleased to be a judge of a couple of the many competitions at the Stevenage Dog Watch Carnival Day. Stephen said, "I thoroughly enjoyed the day and am pleased to be associated with this great organisation. I think it is a fantastic initiative that helps tackle crime by providing a great partnership between the police and the local community." The Stevenage Dog Watch scheme is in its second year and was the first of its kind in Hertfordshire. It aims to encourage dog walkers to report suspicious incidents to police and also to report environmental issues to the council. It has been developed with the help of Neighbourhood Watch and members get regular updates on incidents of note as well as crime prevention advice. Stephen added, "I would encourage anyone with a dog to have a look at the website www.stevenagedogwatch.org and begin to take part." Sarah Shelrick, who is the Dog Watch Co-Ordinator, said "I was very pleased with the turnout and how the event went. Dog Watch is growing and I am so pleased with the interest which people are showing; we now have over 900 members. I would like to thank Stephen McPartland for judging some classes and also Assistant Chief Constable Steve Divine and Detective Superintendent Jane Swinburne who also did some judging. And everyone else who made it the best event ever."